Scooper - Technology News: What are the pitfalls of Eurozone bilateral trade imbalance measures? What are the pitfalls of Eurozone bilateral trade imbalance measures? Is there a need for further adjustment?If so, what needs to be adjusted?Should the objective be to improve bilateral current account balances, and what combination of tools are actually available to EZ policymakers in order to do so? 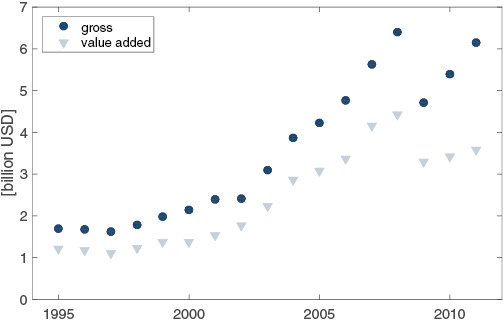 Global value chains can greatly distort the reported trade flows between countries (Koopman et al.2014, Johnson and Noguera 2012) and can generally undermine the validity of standard competitiveness indicators, as argued in several reports by the ESCB’s Competitiveness Research Network CompNet (e.g. di Mauro and Ronchi 2015). The issue is that official trade statistics are reported in ‘gross’ terms, which measure the value of the physical flow of goods (and services) across borders. The prevalence of trade in intermediates implies that countries do not necessarily consume the goods that they import, but rather that they often use them as inputs in the production of other final and intermediate goods that may again be exported to other destinations. In order to correct for this, a number of papers have proposed alternative measures which extract the value added embedded in gross trade flows. Hence, value-added trade statistics capture the origin of the value added of final goods that are consumed in any given country. For the vast majority of EZ countries (16 out of 19), trade balances measured in value added terms vis-á-vis the Eurozone as a whole were smaller (and therefore those with non-EZ countries larger) than the ones measured in gross terms.Looking at deficit countries, the ratio was particularly low for France, Portugal, and Italy (in increasing order). 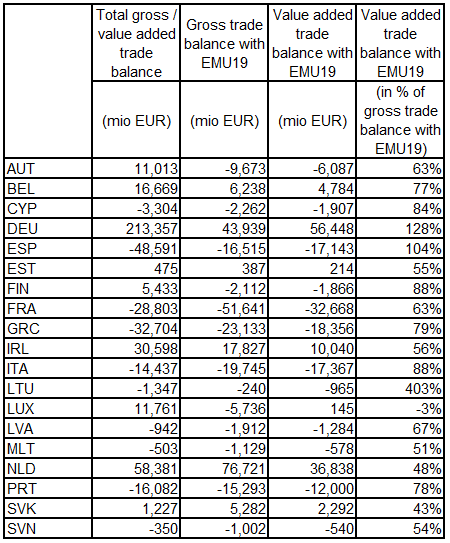 This implies that the trade balance with the Eurozone in gross terms would be increasingly less amenable to the adjustment of domestic demand and relative prices of these countries with their EZ trade partners. 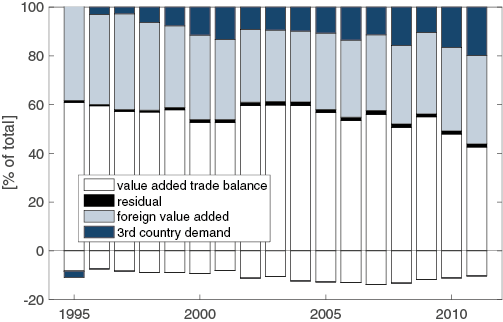 As explained above, bilateral value-added balances account and correct for third country demand effects, foreign value added, and double counting in trade flows (Koopmanet al.2014, Nagengast and Stehrer forthcoming).Value-added flows also take into account that gross exports often contain a large share of domestic services value added, which is critical when assessing adjustment needs of relative prices (Bems and Johnson 2012, Patel et al.2014).